The National Gallery of Art is decidedly not off-the-beaten-path, yet its Garden Café has a hidden treasure that is one of the most delightful and delicious food conceits in the city. The Café features a $19.75 all-you-can-eat menu that is designed by a well-known Washington chef and inspired by the featured exhibit in the museum’s ground-floor galleries. 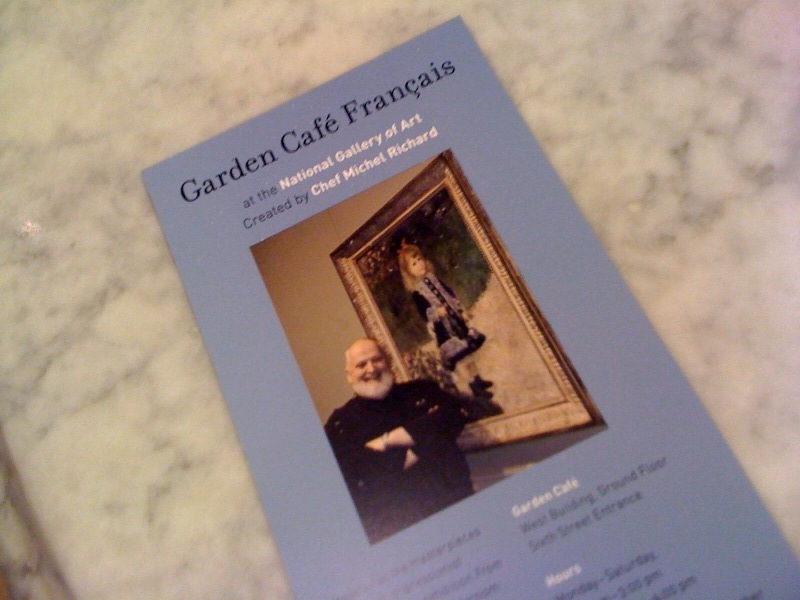 Currently the Garden Café reflects the “From Impressionism to Modernism: The Chester Dale Collection” exhibit, and runs until February 10th 2011. Perhaps best of all for the amateur DC foodie is that the menu is hand-designed by Chef Michel Richard, of Central and Citronelle fame. Previous Garden Café themes over the last few years have included Spanish by celebrated Chef Jose Andres, “Summer in Venice” featuring traditional Venetian dishes, Central American inspired by ancient Mayan recipes, and the American Café serving crab cakes and Boston cream pie. Upcoming in mid-February is Garden Café Italia, with a menu designed by Chef Fabio Trabocchi of Fiola. The menu of the “Garden Café Français” is an impressive array of classic French food, from Camembert and Roquefort cheeses and charcuterie to soups and salad to ratatouille and stew. 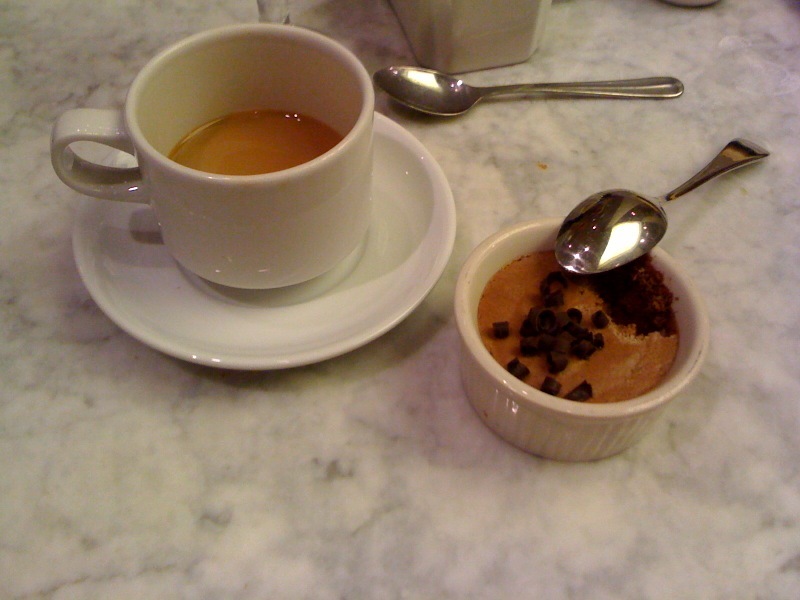 Especially divine, of course, was the chocolate mousse. 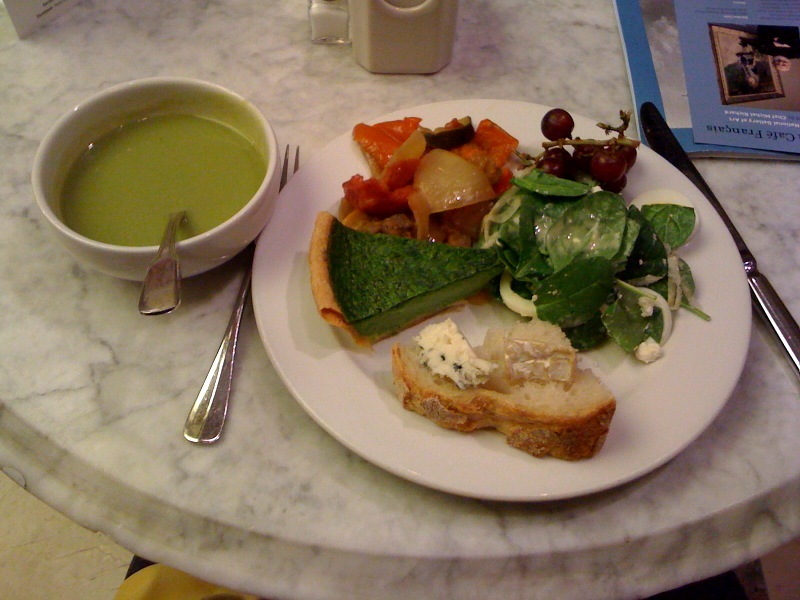 Although all-you-can-eat French food is a tad oxymoronic, I was certainly back for more than one plate! I will give major points to the National Gallery of Art for its impressive set of vegetarian options, especially for such a condensed menu. The Garden Café’s atmosphere is wonderfully charming, with dozens of skylights and a tinkling fountain displaying Herbert Adams’ sculpture Girl with Water Lilies. It is quite fun to eat while the hubbub of the museum carries on around, and feels nearly improper to be sipping a cup of coffee and eating mousse while tourists wander aimlessly nearby! If brunch and art history is your perfect pairing, this is the place for you. 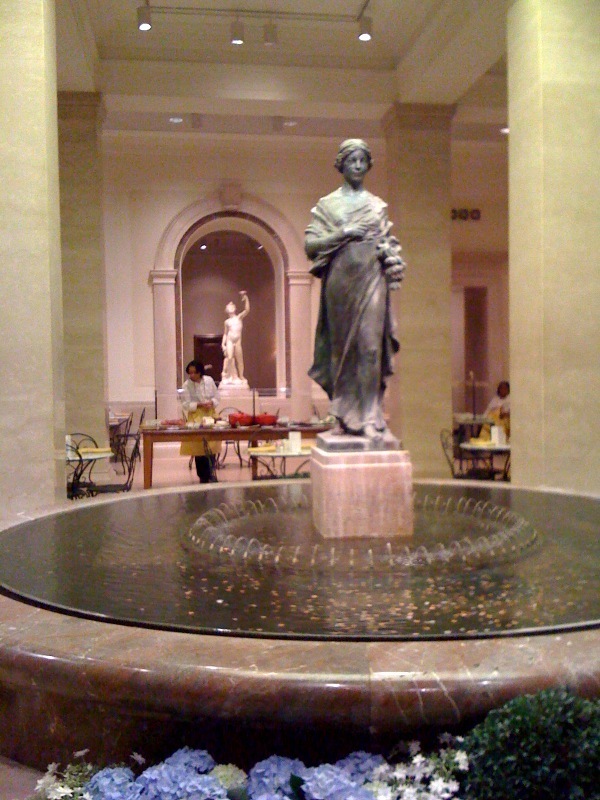 To get there: National Gallery of Art west wing, (202) 712-7454. Hours: Hours Monday–Saturday 11:30 a.m.–2:00 p.m., Sunday noon–4:00 p.m. NGA is right on the Mall, so accessible from various metros and bus lines. *Correction: an earlier version of this post incorrectly referred to the National Gallery of Art as a part of the Smithsonian Institution. Thanks to a savvy commenter for pointing this out! My smarmy side got the urge to recommend a spelling correction when I received your email distribution of this blog posting, but when I arrived at the page, I saw you had changed Galley to Gallery. Also, the National Gallery of Art is not part of the many museums and research collections that make up the Smithsonian Institution. It is a separate entity although like the Smithsonian it is federally funded and its employees are government employees. Thanks Kate! You are right, the National Gallery of Art is not technically a Smithsonian. Appreciate you pointing it out!